if you require amounts over 2000, check prices here and also on the 3-5 day flyers as those prices may be less expensive. 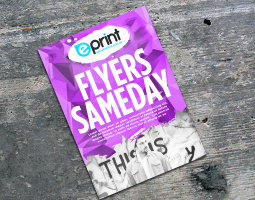 Perfect Flyer Printing Brisbane. Our customers never tell us they got a better flyer printed somewhere else because we test all of the best brand printers and select the one with the highest quality print. We produce the highest quality flyers, our time-frames are untouchable and our service is second to none! Try us today for your next print order. they are printed on an Offset Press, giving us more buy power with our paper merchants for larger volume run orders. page allowing you to get your file to us. The bizhub PRESS C7000 Production is a perfect solution for our bureau as we specialise in short-run, on-demand print jobs.It is the fastest digial machine for Flyer printing Brisbane and Brochure printing Brisbane It excels in transactional environments that require high speed to turn jobs around quickly, and offers large paper and output capacities for automated long-run operation. Great for brochure printing Brisbane and flyer printing brisbane. Konica Minolta’s proprietary polymerised toner, Simitri® HD, uses biomass as one of its components. This makes it CO2-neutral during recycling. In addition, Simitri® HD enables fusing at lower temperatures, reducing energy consumption and further reducing related CO2 emissions.